Bangkok, Thailand — Voting has closed in the long-delayed elections that Prayuth Chan-ocha, the general who led the coup against the country’s last elected government five years ago, hopes will return him to power as a civilian prime minister. The prime minister will be the person who can secure a majority across both houses, and the 250-seat senate is seen as giving Prayuth an advantage. With counting underway at the nearly 93,000 polling stations across the country, the Elections Commission told reporters that turnout was high. In early voting last week it was 87 percent. 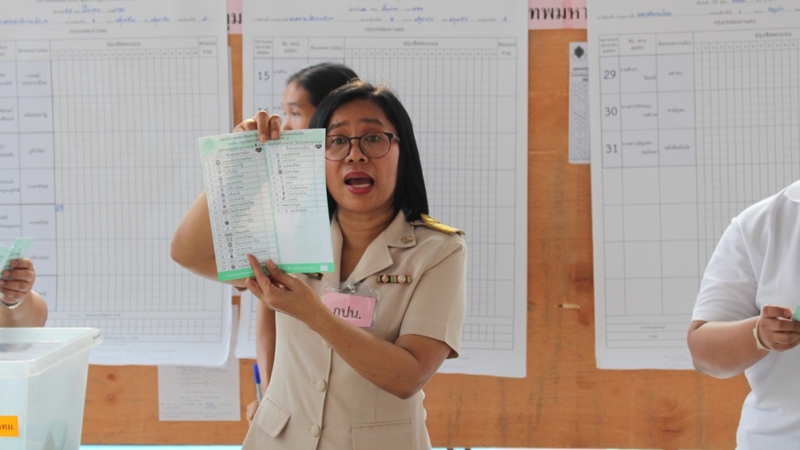 At a polling station in the Jula hospital of Chulalongkorn University, election officials counted down the minutes to the closing of the polls and a few stragglers rushed to cast their ballots. Nurse Pornsiri Supkong arrived in a puff with five minutes to spare. The 23-year-old said she had decided who to vote for after analysing party policies, but had also concluded that after so many years of division it was time for Thailand to try something new. ‘I looked back at the conflict and I thought I want to break from that,’ whispering that she had decided to back Future Forward. The vote count in the polling station, one of the 6,000 in Bangkok, showed others seemed to share her view with Future Forward performing strongly, and Prayuth’s Palang Pracharat in second place. ’We are beginning to see the future,’ said two students as they walked away. Campaigning has been spirited and Pheu Thai, the party linked to former prime minister and exiled tycoon Thaksin Shinawatra that has its power base in the rural northeast, is expected to win the most seats. Other major parties include the Democrats, Thailand’s oldest political party, under Abhisit Vejjajiva. Future Forward, is a new party founded only last year by car parts billionaire Thanathorn Juangroongruangkit. It has campaigned on a promise of change and military reform. Thais are choosing their representatives through a complicated system that includes both direct votes and a party list, and while the official results will not be announced until after the coronation of King Vajiralongkorn in May, the Elections Commission is expected to announce preliminary results hours after the polls close. The King himself released an announcement on the eve of the election that was broadcast across national television to say that Thais should support ‘good people’ to run the country. ’It’s significant that the King made a comment so close to election day,’ said David Streckfuss, an independent historian based in Khon Kaen in the northeast. Thailand has been consumed by divisions between supporters and opponents of Thaksin Shinawatra, since he was elected prime minister in 2001 promising to help ordinary people who had long felt ignored by the traditional elites in Bangkok. Thaksin was ousted in a coup in 2006 after mass street protests by the so-called ‘yellow shirts’ and lives in exile after being found guilty of corruption. He says the charges were politically motivated.